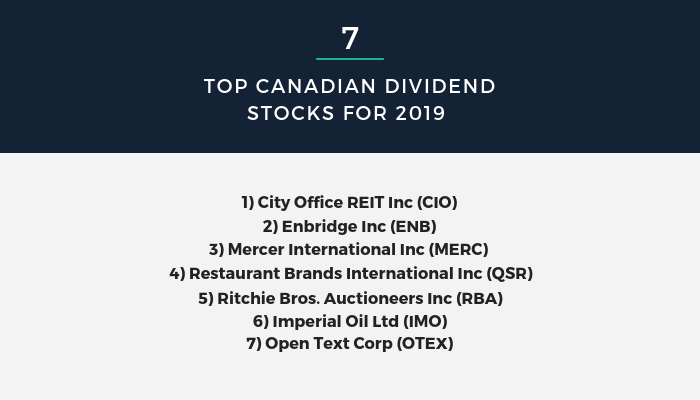 There are plenty of dividend stocks you can choose from in the United States, but don’t forget about the top Canadian dividend stocks as well. Investing in Canadian stocks that pay a consistent dividend can increase your monthly income, diversify your portfolio, and protect against adverse market movements. Below are 7 high yielding Canadian stocks for you to consider adding to your portfolio as we move into 2019. *All price and stock information is accurate as of December 4th, 2018. City Office REIT Inc (NYSE:CIO) is a real estate investment trust, headquartered in British Columbia, Canada. City Office REIT acquires, owns and operates office properties primarily within the Southern and Western United States. The Company was founded in 2013, and it’s current CEO is James Farrar. City Office REIT competes in the Financial Services - Real Estate Sector, and has grown revenue from $58 million in 2016, to $66 million in 2017, to $83 million during the Trailing Twelve Month (TTM) period ended September 30, 2018. From July 2014 to December 2018, City Office REIT's average monthly dividend yield was 7.54%. Enbridge Inc (NYSE:ENB) is an oil and gas company, headquartered in Alberta, Canada. ENB was founded in 1949, and it’s current CEO is Albert Monaco. ENB competes in the Energy Sector, and has grown revenue from $34.6 billion in 2016, to $44.4 billion in 2017, to $47.7 billion during the TTM period ended September 30, 2018. From December 2015 to December 2018, Enbridge Inc's average monthly dividend yield was 5.51%. Mercer International Inc (NASDAQ:MERC) is a pulp company, headquartered in British Columbia, Canada. MERC was founded in 1968, and it’s current CEO is David Gandossi. MERC competes in the Consumer Non-Durables Sector, and has grown revenue from $931 million in 2016, to $1.2 billion in 2017, to $1.4 billion during the TTM period ended September 30, 2018. From December 2009 to December 2018, Mercer International's average monthly dividend yield was 1.51%. Restaurant Brands International Inc (NYSE:QSR) is a quick service restaurant company, headquartered in Ontario, Canada. QSR was founded in 2014, and it’s current CEO is Daniel Schwartz. QSR competes in the Leisure Restaurants Sector, and has grown revenue from $4.1 billion in 2016, to $4.6 billion in 2017, to $5.2 billion during the TTM period ended September 30, 2018. From December 2014 to December 2018, Restaurant Brands' average monthly dividend yield was 1.37%. Ritchie Bros. Auctioneers Inc (NYSE:RBA) is an industrial auctioneer company, headquartered in British Columbia, Canada. RBA was founded in 1958, and it’s current CEO is Ravichandra Saligram. RBA competes in the Business Services Sector, and has grown revenue from $566 million in 2016, to $610 million in 2017, to $745 million during the TTM period ended September 30, 2018. From December 2013 to December 2018, Ritchie Bros. Auctioneers' average monthly dividend yield was 2.56%. Imperial Oil Ltd (AMEX:IMO) is an integrated oil company, headquartered in Alberta, Canada. IMO was founded in 1880, and it’s current CEO is Rich Kruger. IMO competes in the Energy Sector, and has grown revenue from $27.4 billion in 2016, to $29.4 billion in 2017, to $35.3 billion during the TTM period ended September 30, 2018. From December 2007 to December 2018, Imperial Oil's average monthly dividend yield was 1.69%. Open Text Corp (NASDAQ:OTEX) is an independent software company, headquartered in Ontario, Canada. OTEX was founded in 1991, and it’s current CEO is Mark Barrenechea. OTEX competes in the Technology Sector, and has grown revenue from $2.3 billion in FY2017, to $2.8 billion in FY2018 (ended June 30, 2018), to $2.8 billion during the TTM period ended September 30, 2018. From June 2008 to December 2018, Restaurant Brands' average monthly dividend yield was 31.71%. Dividend stocks are an important part of any good portfolio. Adding these seven Canadian stocks will provide monthly income, and diversify geography risk if most of your holdings are U.S. Companies. But… Remember to be careful, and research all stocks before investing. Especially stocks with unusually high dividends. Some unstable stocks use high dividends to entice investors. But they aren’t generating enough cash flow to continue paying dividends at their current rate. If you are looking for more of the highest yielding dividend stocks, check out our customized stock screener. Our stock screener gives you the control to find and screen for stocks according to your unique investment strategy. Select the criteria and benchmarks that fit with your investment strategy to find undervalued stocks to add to your portfolio.